Every year I get dozens of emails asking, “where is the best place to put my beehive?”. So, I finally sat down and put together some of the considerations I recommend that you take before placing your beehive! I hope that this helps. The information is also on a downloadable PDF here. Why Hive Placement is Important. Honeybees are funny little critters, as they aren’t like other pollinators. If the conditions aren’t perfect, they won’t fly. This means that if it’s too cool, windy, or wet, they will stay home, taking away from excellent foraging opportunities that bumble bees and solitary bees take full advantage of. Therefore, hive placement is generally considered as a key way to ensure maximization of potential honey production. But, I feel as hobbyists, that the priorities change as the potential locations available on your small urban property or on other properties of family or friends away from home. There is a saying, “5 feet equals 5 kilometers”. That means that you cannot just pick up a beehive and move it across your yard out of necessity. Honeybees have a very detailed map of their environment, and when they fly out foraging, if they see the usual markers of location, they will muster where the hive was. And since bees can fly up to a 5mk radius from the hive in their search for nectar, they have a detailed map of the 5km radius from the hive. So, moving your hive either in small increments over time or one major movement (over 5 kms away) for over a month in the summer months is essential if a move is necessary. Honeybees do not like the wind whipping in to their hive. It can make it challenging for the bees to regulate the temperature of the hive and keep brood warm. If the bees have a lot of wind and or wind coming in the hive, they will fly less and put energy in reducing the entrance with propolis. A lot of wind at the entrance of the hive can make the bees more aggressive when doing inspections, as there will be more bees in the hive on inspection, stress levels may be elevated, and the amount of nectar and pollen coming in will be less than normal. Honeybees love the sun, and plants have a higher nectar load in the morning, so it is best to place the hives in a way that will allow for morning sun to flood the entrance of the hive earliest in the morning: East. Honeybees love the sun as it warms the hive up, makes it easier for the bees to keep the brood nest at a balmy 33-36 degrees Celsius. So, many hives are painted white but placed in open fields without much concern for the hive overheating. How can that be when the hives may be in 30 degree heat for hours a day? Honeybees are able to cool down the hive by fanning at the entrance, forcing air in to the hive and offering air flow through the dead air spaces. The bees also need to evaporate the excess moisture from the nectar to appropriately ripen the honey (14-22% moisture content for honey). This evaporation process takes energy, and therefore works as an air-conditioning system within the hive. If it is exceptionally hot, the bees will carry water in to the hive, bead it on to the comb and walls, and evaporate that. Bees carrying and gathering water aren’t gathering or carrying nectar though, so it is best to not have a hive over heat. Convection currents work in a vertical space very effectively. This means that hot air rises and cool air sinks. This is because of the energy of the air molecules (high energy equals higher temperature and more space between the molecules, and therefore less dense, and vice versa). Because of this, Langstroth and other vertical hive designs manage higher temperatures better than horizontal hive designs. Convections aren’t as successful in a horizontal design, but there are ways to combat this. One way is to have a cork-hole at the back of your horizontal hive to create a vacuum, allowing for more even air flow and decreasing the chances of dead air spaces which cause potential comb melt. Another common option in lower altitudes and areas with consistent weather (therefore, not Alberta) is to have a screened bottom board, allowing for consistent air flow throughout the bottom of the hive and making the convection work without much trouble. Another option is to create spaces less than 3/8” (bee space) between brood bars, which will allow the air to move out from the hive centre. The bees will propolize this closed if they don’t like it later in the season, so it is best to keep an eye on this during inspections. Remember, if the space is greater than 3/8”, the comb will be built thicker and can make for an increased challenge in inspection. Hot Tubs and Neighbors Pool? Grass Down at the Entrance? Take a drive around your bee yard and think about what the bees have access to eating throughout the year. It is a great practice as it encourages you to look at nature from a different perspective: from the perspective of a bee. Consider monocultured fields, golf courses, parks, football fields, industrial parks, railway tracks, ditches, and water ways. These are all good indicators of what the bees have access to. Also consider the local regulations of cosmetic pesticide use on city and municipal lands. There are many advocacy groups seeking to change bylaws and I am sure that they would like to hear from you and have a lot of information to share with you on the subject of products used and localized application dates. Having too many bees in an single area can cause for competition between honeybee colonies, and also between native bee populations and the honeybees. So, it is best to find out if there are beekeepers near you. Through A.B.C, we keep track of the beekeepers receiving bees through our Community Hive, and you can see how many colonies are in your postal code area. Many cities and municipalities have licensing arrangements in place, so contact your local authorities to find out what you can. Taking a drive around will help too, giving you a visual idea on the bees in the area. There have been thefts of honeybee colonies reported annually throughout Canada. It is important that where you place a hive, rural or local, that you don’t place the hive conveniently close to a road way or pathway. Vandalism in an urban space is also a consideration when placing a beehive. Think of the worst case scenario and place a hive with those considerations to ensure safety of your bees and of your community. Away from Livestock, Bears and Predators? Travel Time between You and Your Apiary? This is a behavioral consideration with humans, not bees. It is great to place your bees at a great location for the bees, but if it is inconvenient for you to access your hives for inspection once every 10 days, then you should consider moving them closer to you. 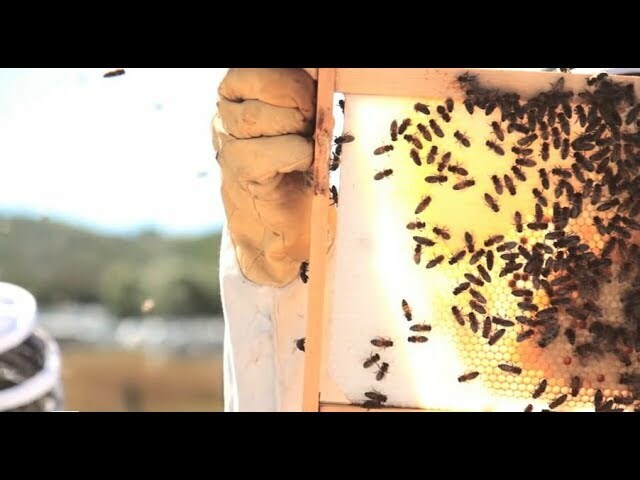 As a beekeeper, you are responsible for the maintenance and care of your colonies. So, place the bees where you will access them the most and reliably so. Flight path of the honeybees is called a ‘bee-line’. Think of it like planes landing on an aircraft carrier. You have a 3ft buffer between the landing board and your options for altering the directionality of the bee-line. You can place barriers at the 3ft distance to encourage the bees to fly up or to the side. You can do this by putting the bees by a fence or artificial barrier. This will force the bees up and to continue on their bee-line at a height upwards of 6 feet, taking the direct flight pattern out from the yard or neighbour’s yard. I live in Scarborough near the bluffs. My property is 1/3 of an acre on a ravine with forest in the back yard. Unfortunately, the only place to put a hive is at the extreme back portion of the property near the chain link fence. This would violate the 30M rule and the hive would be in dappled shade during the temperate months. I find it interesting that given the particularly dire state of beekeeping in North America at the moment that the Ontario stature virtually guarantees that there with be practically NO urban beekeeping going on under the current rules. Can I keep bees or will I get in trouble?